Macroplastique has been used safely and effectively in over 70,000 patients since 1991. Many clinical studies have reported Macroplastique to be clinically effective with a low rate of side-effects (individual results may vary depending on your type of urinary incontinence). So, you can be assured of its safety and effectiveness. 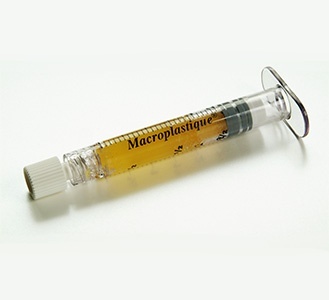 Macroplastique is an injectable soft-tissue bulking agent for treating stress urinary incontinence and vesicoureteral reflux. Macroplastique is made up of two parts – the water-soluble gel (polyvinylpyrrolidone) that is absorbed and removed from the body in urine and the man-made, rubber-like, silicone elastomer implant material (cross-linked polydimethylsiloxane) that is permanent and not absorbed by the body. It is this permanent material that causes the bulking effect after implantation. Macroplastique adds volume to the tissue surrounding the urethra. This extra volume increases the urethral closure pressure to prevent urine leakage during normal, everyday activities such as standing, coughing and physical exercise. Prior to the procedure, the doctor will give you an antibiotic to reduce the risk of infection. Upon the start of the procedure, the doctor will give you local anaesthetic in the tissues near your bladder to reduce discomfort. Your doctor will also fill your bladder to halfway with water or saline to better view the implantation area. There are two different ways in which your doctor can implant Macroplastique. An optical instrument (cystoscope), placed in the urethra, is used during the procedure to allow your doctor to view your urethra and bladder while injecting Macroplastique into the surrounding urethral tissue. The optical instrument is removed after the injection and your treatment is complete. The Macroplastique Implantation Device (MID), a small plastic device is placed in the urethra. The device has angled holes to aid in injection of Macroplastique. After the injection, the device is removed and your treatment is complete. Both procedures are safe, minimally invasive, equally successful, and can be done in less than 30 minutes as an outpatient or day case procedure. Your doctor may choose to use either local anaesthesia or general anaesthesia. Most women can go home on the same day. In some cases an overnight or short hospital stay is normal. Most women are able to resume normal activities or return to work shortly after their treatment. Prior to the procedure, the doctor will give you an antibiotic to reduce the risk of infection. Upon the start of the procedure, the doctor will give you general anesthetic. Your doctor will also fill your bladder to halfway with water or saline to better view the implantation area. During the procedure, an optical instrument (cystoscope), placed in the urethra, is used to allow your doctor to view your urethra and bladder while injecting Macroplastique into the surrounding urethral tissue. The optical instrument is removed after the injection and your treatment is complete. The procedure is usually performed under general anaesthesia as a daycase procedure, usually in less than 30 minutes. Most men can go home on the same day. In some cases, an overnight or short hospital stay is normal. Most men are able to resume normal activities or return to work shortly thereafter. Macroplastique is a safe, minimally invasive treatment that does not require an incision. It is an effective treatment for children when their vesicoureteral reflux fails to resolve on its own or in cases where antibiotics are not controlling infection. This treatment can also be used if previous surgery fails. Your child will undergo general anaesthesia, and may stay one night in the hospital. The doctor implants the Macroplastique bulking agent into the bladder wall under the ureteral orifice. The Macroplastique forms a small volcano shaped mound, thereby restoring the normal valve function. Health and scientific authorities around the world have rigorously evaluated the biocompatibility and safety of Macroplastique. For more than a decade Macroplastique has been used to successfully treat and cure thousands of children, thus providing them with an excellent quality of life.